Well that's pretty simple, Stardock can continue not saying in game that SC2 is part of the SCO multiverse. And that would be for the best. They had already said this, it's the same point as their previous post. How does it further anything? It's the same subject, but they elaborated on it to defend their position. Seems like a genuine attempt at discussion to me. Yeah, I know that works. I usually wait to purchase something until it has a Linux version so that they get money specifically for making the linux version, but in this case I went ahead and bought it ahead of time anyway. However, these "grey areas", as you put it, are exactly the problem. And while SCO's hyperspace expression definitely counts as a "grey area", the multiverse claim does not. If SCO takes place in the same multiverse as UQM (let alone shares characters with it), it is a derivative work of UQM (since being in one universe/multiverse or another is a question of story, and story is definitely covered by copyright). Derivative works can only be made by those who own the copyright to the original work or a license to it. Since Stardock has neither, Stardock claiming that SCO takes place in the same multiverse as UQM would be copyright infringement. That's not how copyright works. If it's an association issue, it's trademark. Stardock owns the trademark free and clear. The Star Control games exist within the Star Control multiverse because we say what is and isn't in the Star Control multiverse. If we were to say that the Star Wars universe is in Star Control universe, that would be an issue because of the trademark (consumer confusion) not because of copyright. If you can't put A and B next to each other and get a person to agree (or disagree) that one is a copy (substantially similar) of the other then it's not a copyright question. Most of the mistaken arguments I've seen on this dispute is the association fallacy. Trademark controls association. Not copyright. As I understand it (though of course I may still be wrong here), consumer confusion is all about real-world associations - for example, a product that is marketed under the Star Control trademark is associated with the current owner of the mark (Stardock). You are correct in that you can slap the Star Control trademark on various products that you own and declare them part of the Star Control multiverse. I'm not talking about real-world associations, though. I'm talking about fictional associations in a fictional universe. SCO makes references to other universes existing in addition to the Origins universe that the game is set in. Therefore we can assume that from the point of view of, say, the Captain, the Precursors, the Observers, etc. there are other universes out there, that there is, as F&P put it, a "hyper-dimensional" connection between the UQM universe and the SCO universe. That's a story issue. So if you say that the UQM universe (which is owned by F&P) is part of the Star Control multiverse, then to an observer from the UQM universe the SCO universe also exists as a real entity. Basically, F&P must edit their story against their will because someone other than them owns the Star Control trademark? Don't copyright owners hold exclusive rights to their stories? I realize that I've already had a similar discussion with you over half a year ago on the UQM forum, and I realize it's up to the court to decide who is right... So I'll understand if you don't want to continue this discussion. Copyright does not grant P&F ownership over the "UQM" universe. It grants them control over distribution of the expression of the story that exists in SC1 and 2, and it also grants them a certain degree of control for "derivations" of the material in those two games. Ownership of the "universe" however requires the ability to control usage of things like names, which copyright does not grant. 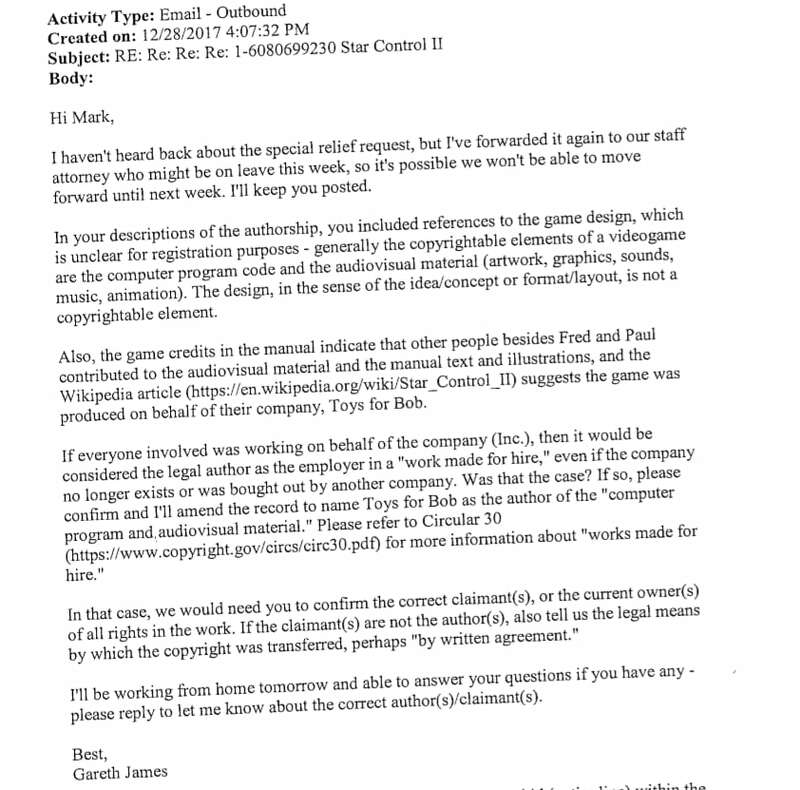 Trademark does, which means P&F do not have legal standing to even expand the UQM story if they wanted to without the consent of the Star Control trademark holder, which in this case is Stardock. The USPTO interprets copyright of videogames to only be for source code and audiovisual material, not design ideas/concepts. They left lore out for some reason. The USPTO also did not bring up SCO possibly being a "derivative work" of SC2 for some reason. The USPTO interprets copyright of videogames to only be for source code and audiovisual material, not design ideas/concepts. They left lore out for some reason. I believe that lore is covered by "script/screenplay", which is present in F&P's second copyright registration for SC2, which covers just that and audiovisual material. The source code was covered by their earlier copyright registration. zwabbit's post just now might have the answer. I still don't know how to decide if something is a "derivative work" or not, though. I'll refer to the fairly straight forward example I gave earlier. If you can't put A and B next to each other and compare, then it's not a copyright discussion.